PRODUCT: 2-1/2" x .093" Coil Siding Nail, Ring Shank, 304 Stainless Steel, 15 degree Wire Collated, 300/coil, 12 coils/box. 3,600 Nails/box. Price/Box. 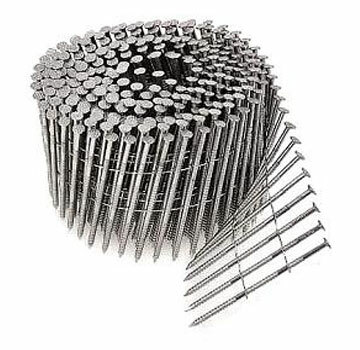 15 Degree Wire Collated Siding Nails. ANSI Grade 304 Stainless Steel. .234" Head Diameter, Waffle Texture. 300 Nails/Coil, 12 Coils/Box. 3,600 Nails/Box.